The Galaxy S9 and S9 Plus were two of the most anticipated devices of 2018. These handsets offer great specs, a great display, and an amazing camera. Unfortunately, there is one downside to these smartphones – the battery. 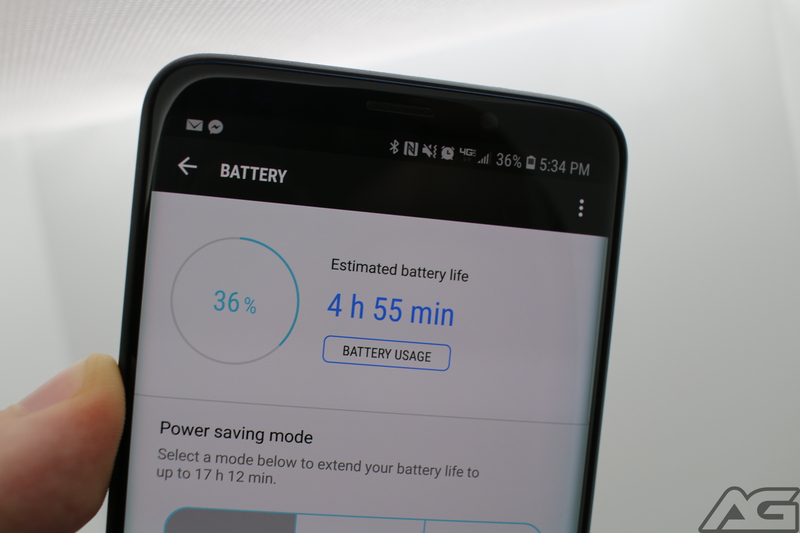 Thanks to the Galaxy Note 7 debacle, Samsung has been playing it safe with pushing the limits of batteries in its different devices. The same can be said about the Galaxy S9 and S9 Plus. A 3,000mAh battery is packed into the smaller S9 while the S9 Plus sports a 3,500mAh battery. These capacities are the same that were found in Samsung’s 2017 flagships. Respectable, sure, but let’s see if we can’t get them to last longer. Luckily, there are a slew of different software tweaks that can be made to help improve the battery. We’re going to take a look at nine different steps you can take to extend the battery life on your S9 or S9 Plus. There is an option from the AOD settings, to have a schedule for when this feature is turned on. This may be another route for you to take, especially if you don’t need AOD to be turned on when you’re asleep. While auto-brightness is designed to make your screen more visible at different times, it’s a bit of a nuisance. This is especially true if you are constantly looking at your phone in different lighting situations. 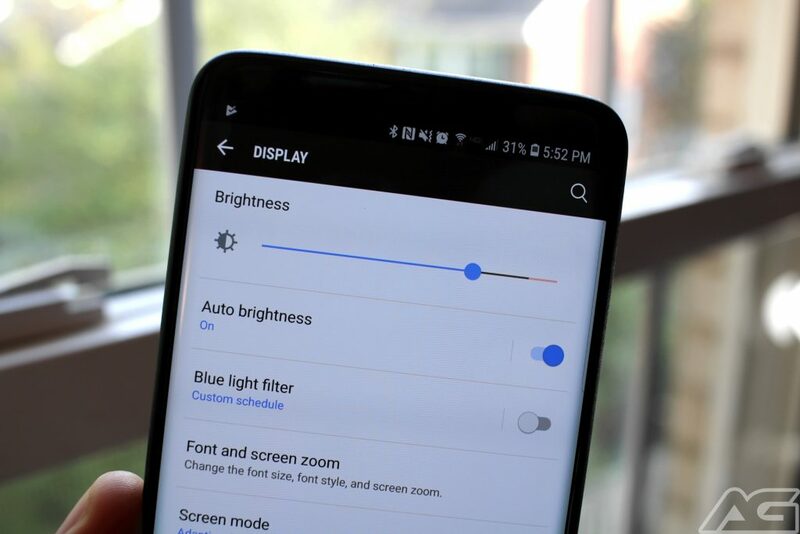 Another way to help save some battery life if you’re running low on time is to lower the brightness manually. This can be done either from the Quick Settings Panel, or from the Display Settings. Samsung is known for manufacturing some of the best mobile displays that we have ever seen. The Galaxy S9 and S9 Plus sport arguably the best display panels ever. These displays feature a resolution of WQHD+ (2960 x 1440). However, it’s unlikely that you will ever be able to really tell the difference between WQHD+ and FHD+ (2220 x 1080). This will bump things down a notch, but will definitely save you some important battery percentage points. Something else that Samsung is known for is packing a bunch of features into its devices. 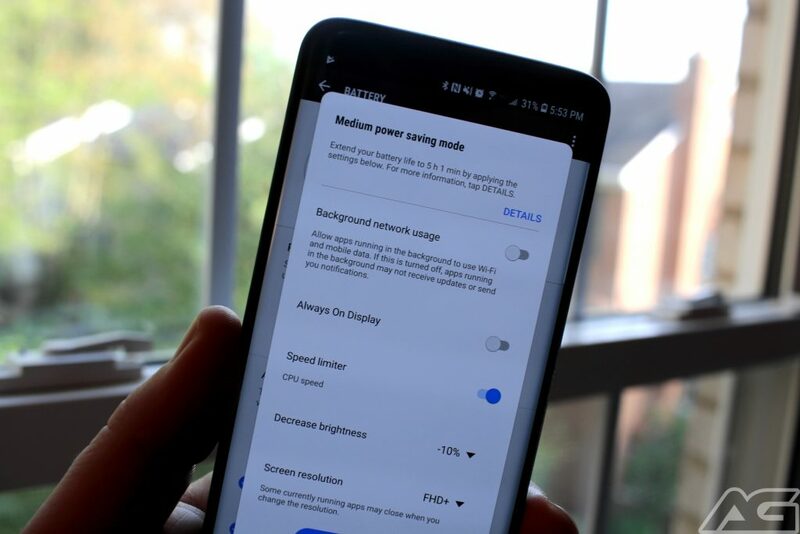 This is where Power Saving Mode comes into play, as there are preset profiles to help squeeze the most battery life out of your Galaxy S9. It’s important to note that when applying these profiles, your device will reveal how much time will be added to your battery life. 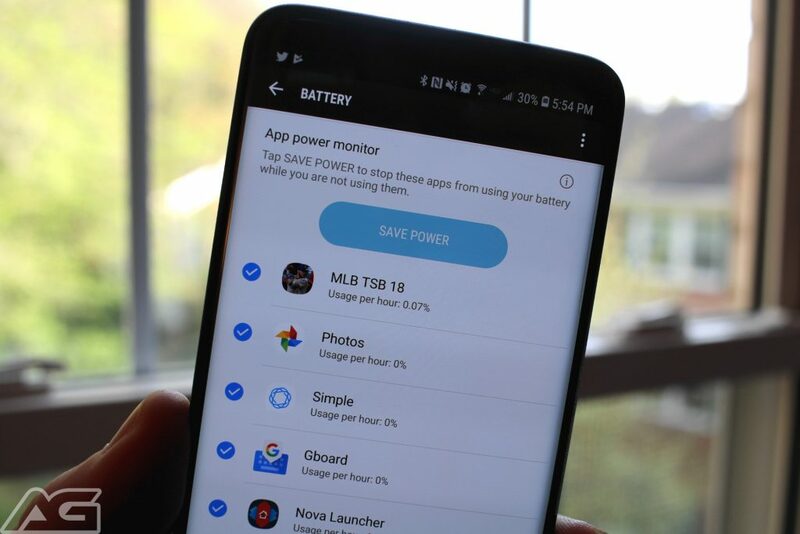 Another way for you to keep your battery in tip-top shape is to use Samsung’s built-in optimizations. This is a feature that is found in the “Device maintenance” section in the settings. 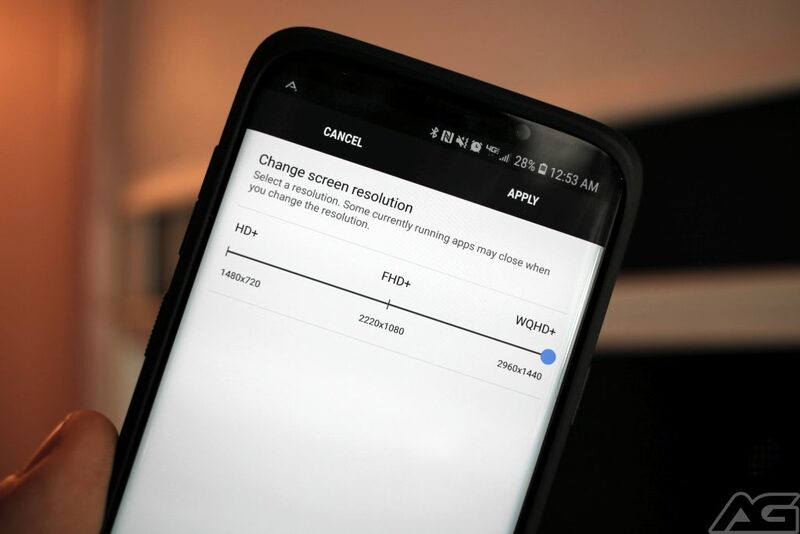 At the bottom of this screen, you will find several different options: Battery, Performance Mode, Storage, and Memory. Selecting each option will allow you to manually optimize the aforementioned section. However, the “Optimize Now” button takes care of all of this at the same time. When completed, apps will be closed, RAM will be cleaned up, and your battery will generally be improved. One of the most popular features in Samsung’s new devices is its iris scanning. 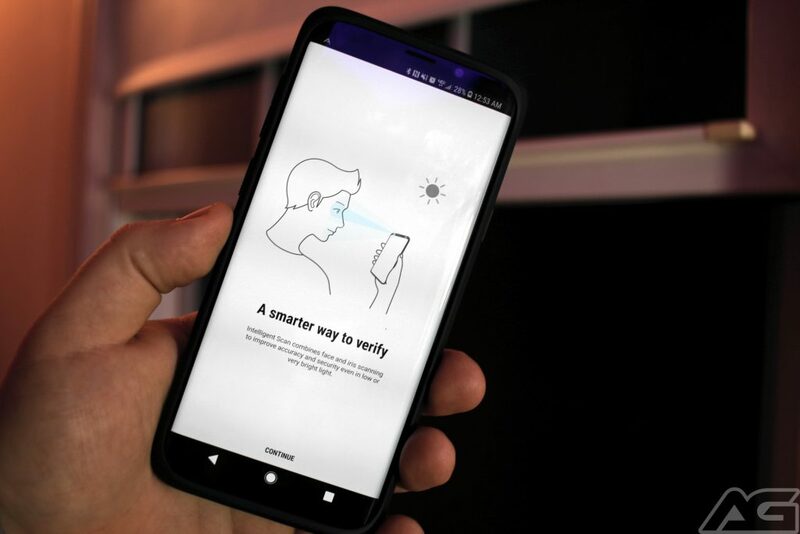 This was introduced last year, and has been improved upon with the Galaxy S9 and S9 Plus. However, since your device would always be looking for your eyes, it can definitely drain some precious battery. Thankfully, Samsung opted to keep the fingerprint scanner on the rear, so you aren’t stuck with just one way to unlock your device. Sure, you won’t be able to unlock your phone with just your eyes or face. But you will still be able to use the fingerprint scanner, or you could be using a “Trusted Device” and don’t have to worry about anything. 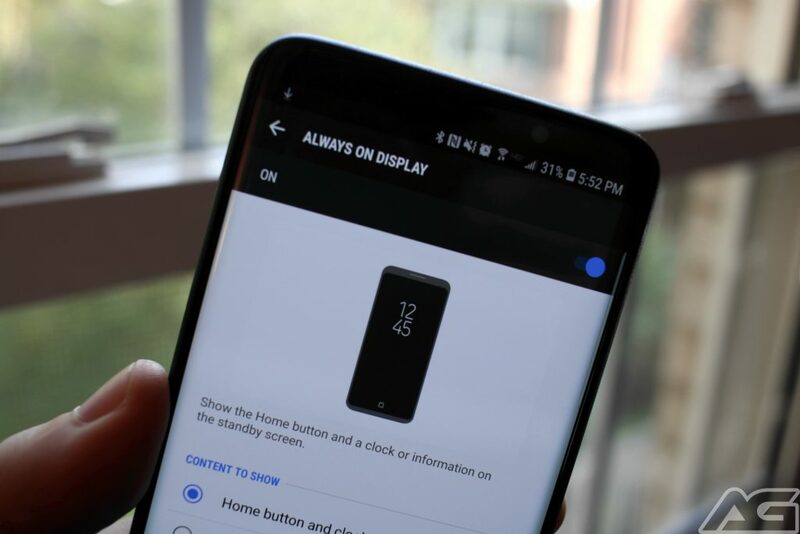 Samsung sure does pack a lot of features into its devices, and the same rings true for the Galaxy S9. 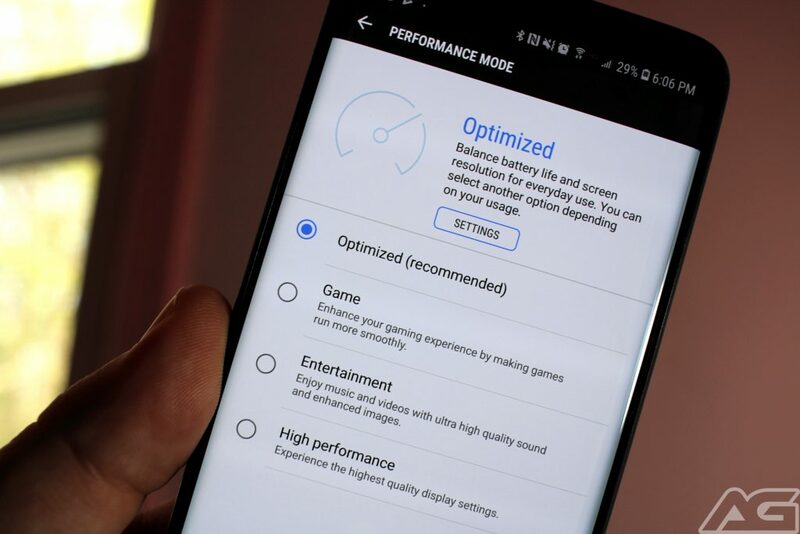 There are different performance modes that the smartphone can run at, and these are all customizable. Once you have entered the Performance Mode screen, there are a few different options. If you have manually optimized your device, then you will simply see “Optimized” at the top. Game: Enhance your gaming experience by making games run more smoothly. Entertainment: Enjoy music and videos with ultra high quality sound and enhanced images. High Performance: Experience the highest quality display settings. 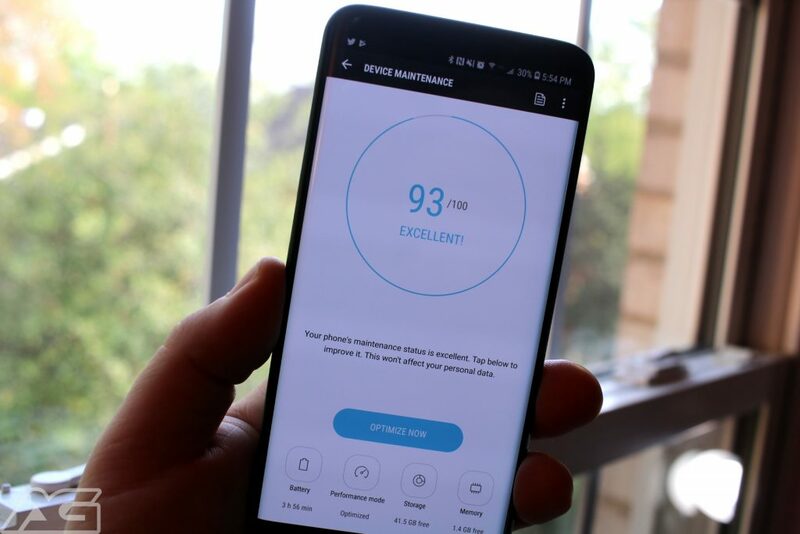 Adjusting these settings will help ensure that your device is running with the perfect settings. These can all be adjusted and customized for your own personal settings. Sometimes you find an app that you absolutely fall in love with. However, there may be something rogue going on that causes the some serious, and annoying, battery drain. From here, you will be greeted with the Power Saving Modes and more. Scrolling down will reveal the “App power monitor” section. This will show you a break down of how much battery each of your apps is using per house. At the top of this section, there will be a “SAVE POWER” button, which will put these apps to sleep. After this has been completed, you should see your estimated battery life improved just a bit. The last option we have to help save you some battery is the simplest method. The Galaxy S9 and S9 Plus sport Super AMOLED displays, which means deeper blacks and more vibrant colors. However, while it may be fun to get the most impressive wallpaper you can possibly find, that won’t help battery. Instead, you will want to use an optimized wallpaper for AMOLED displays, which won’t consume much battery life. If you don’t care all that much for home screen wallpapers, you could even use just a black wallpaper. Luckily, we have one handy for you, and you can just long-press and save it to your device before setting it as your wallpaper. Let us know if this has helped increase your battery life at all!